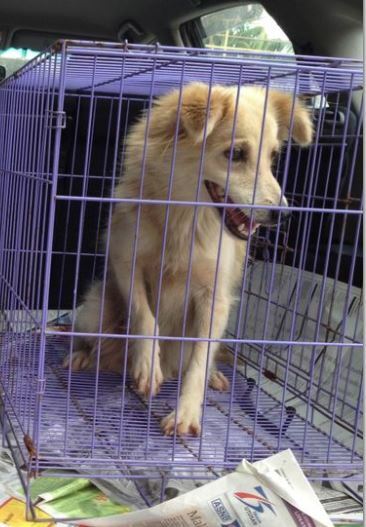 One of our readers picked up a female mixed breed dog who appeared to be abandoned as she is very friendly. The dog has been surrendered to PAWS and another reader has paid two months’ SAPP fee for this dog. Thank you, everyone, for helping the dog. Hopefully she will be adopted from PAWS once she is ready. How do you safely capture a dog? I saw a dog that appeared to be limping near my workplace yesterday morning but I have no idea how to capture it. I didn’t see it again today but if I did, I would want to take it to the vet. I also don’t know how fierce the dog might be. This is the only way I know: Tempt with food, slide leash over head and secure dog. Put blanket over dog (if necessary). Carry into car. Or if necessary, may have to grab and put into car. May have to use gloves too, to be safe.